According to Christopher Gannatti, Head of Research, WisdomTree, the lesson here for investors is the potential to embrace volatility. 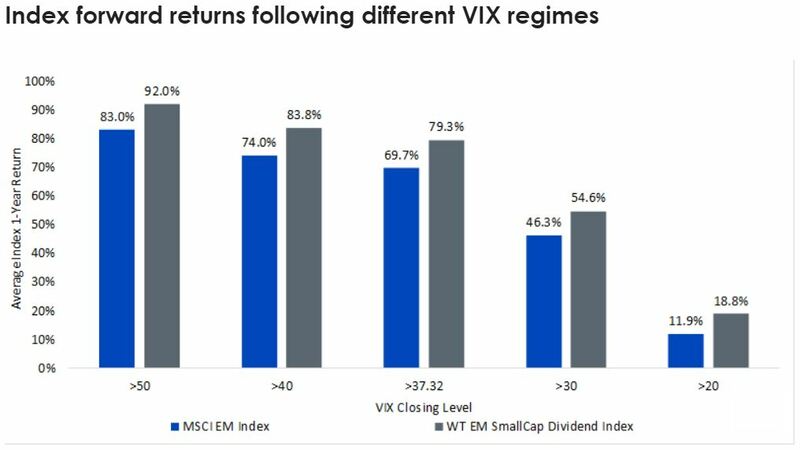 Where a rising VIX typically equates to a short-term equity sell-off, EM investors who have used the dips as buying opportunities historically have seen positive results. Following a relatively tranquil 2017, volatility came roaring back in late January and early February 2018, resting currently generally higher than what was seen last year. Many investors were calling for this change. That said, few foresaw how quickly and how violently that prediction would come to fruition. While there was some debate as to what exactly prompted the pickup in volatility, the bottom line is that the spike in the Volatility Index (VIX) left equity investors running for cover. One thing we found interesting was that during the height of the February 2018 correction, the MSCI Emerging Markets Index outperformed the S&P 500 by almost 150 basis points on the downside. 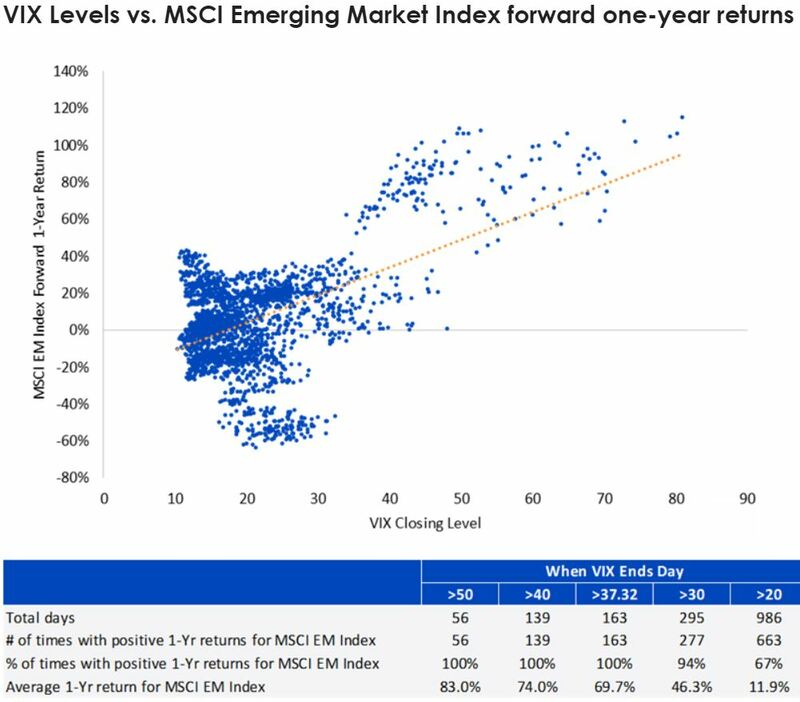 Given that the Emerging Market (EM) asset class historically has had a standard deviation about 50% higher than that of the S&P, EM investors who may have expected the performance of EM to be worse than that of the US were likely pleasantly surprised. The EM outperformance in February 2018 brings to mind a concept that investment strategist Jeremy Grantham has written about: beta is a critical component of explaining relative performance, but valuation can influence beta. Assets that are more expensive relative to their history may experience volatility above their expected levels (and vice versa). When an asset’s price outruns its fundamentals, a downturn in the market can be disproportionally negative when the music stops. With the S&P 500 trading at or near historic highs (a statement we’ve been making for some years now), this concept may become more important to consider. This is the exact same idea that underpins WisdomTree’s original investment philosophy and why we focus on fundamentals. Regarding those fundamentals, within EM we remain encouraged by corporate earnings and believe that the valuation currently offered by the asset class could be underappreciated. Sources: WisdomTree, Bloomberg. Historical performance is not an indication of future performance and any investments may go down in value. You cannot invest directly in an index. Data is for the period 01 August 2007 to 31 August 2018 and corresponds with the inception date of the WisdomTree Emerging Markets SmallCap Dividend Index. On a closing basis, the recent high on the VIX was 37.32, set on 5 February 2018. 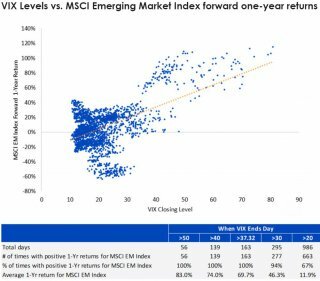 Dating back to 2007, of all 163 instances when the VIX reached levels at least that high, the MSCI Emerging Markets Index had positive returns over the next year on every single occasion—with the average one-year return at 69.7%. While VIX spikes admittedly were clustered around a handful of key events, the results each time were unanimous: the higher the levels reached by the VIX, the higher the forward returns tended to be for EM. The lesson here for investors is the potential to embrace volatility. Where a rising VIX typically equates to a short-term equity sell-off, EM investors who have used the dips as buying opportunities historically have seen positive results. Over our history, we’ve found that our dividend-weighted approach typically has the greatest excess performance relative to cap weighting in lesser efficient markets, particularly in mid-caps and small caps around the globe. Since its inception in 2007, the WisdomTree Emerging Markets SmallCap Dividend Index not only has outperformed the large-cap-focused MSCI Emerging Markets Index, but, contrary to what one might expect with small caps, it has done so with less volatility. This excess performance holds true for both the Index’s entire history as well as immediately following jumps in the VIX. Regardless of how high the VIX went, the WisdomTree Index outperformed the MSCI index in the aftermath of all elevated VIX levels.